Alleged seigniorial right to marital privileges. The feudal lords had the right of giving heiresses in marriage, and there appear to be traces of still more intimate rights over the daughters of tenants, though this has been disputed. An attempt has been made to prove that this right was claimed by either the Greeks or Romans over the Jews in Palestine, and led to the rising of the Maccabees and the institution of the feast of Ḥanukkah, in which Jewesses had a special interest (Shab. 23a). 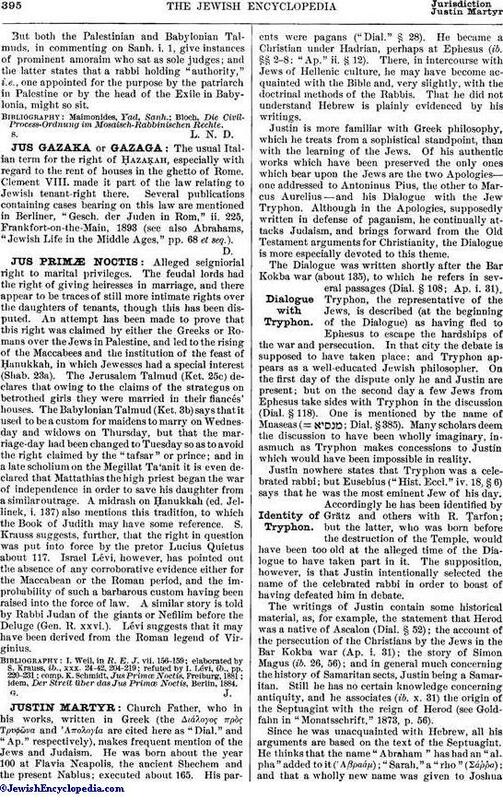 The Jerusalem Talmud (Ket. 25c) declares that owing to the claims of the strategus on betrothed girls they were married in their fiancés' houses. The Babylonian Talmud (Ket. 3b) says that it used to be a custom for maidens to marry on Wednesday and widows on Thursday, but that the marriage-day had been changed to Tuesday so as to avoid the right claimed by the "tafsar" or prince; and in a late scholium on the Megillat Ta'anit it is even declared that Mattathias the high priest began the war of independence in order to save his daughter from a similar outrage. A midrash on Ḥanukkah (ed. Jellinek, i. 137) also mentions this tradition, to which the Book of Judith may have some reference. S. Krauss suggests, further, that the right in question was put into force by the pretor Lucius Quietus about 117. Israel Lévi, however, has pointed out the absence of any corroborative evidence either for the Maccabean or the Roman period, and the improbability of such a barbarous custom having been raised into the force of law. A similar story is told by Rabbi Judan of the giants or Nefilim before the Deluge (Gen. R. xxvi.). Lévi suggests that it may have been derived from the Roman legend of Virginius. idem, Der Streit über das Jus Primœ Noctis, Berlin, 1884.